it is rushing the season a bit, but I'm seeing eggs popping up all over my house! 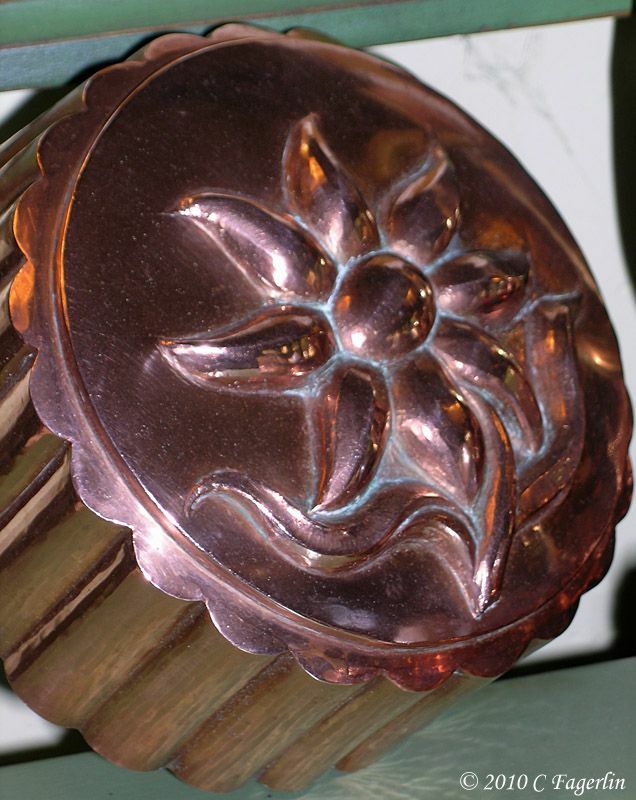 something special when you use a decorative mold like this one. crags in the Alps and are best cultivated in a rock garden that mimics their natural habitat. Grown in partial shade, these plants will develop beautiful woolly flowers with a ring of silvery white leaves surrounding them, which makes then look like large snowflakes. Edelweiss flowers are reasonably easy to propagate from seed and quite hardy if grown in conditions that suit them. 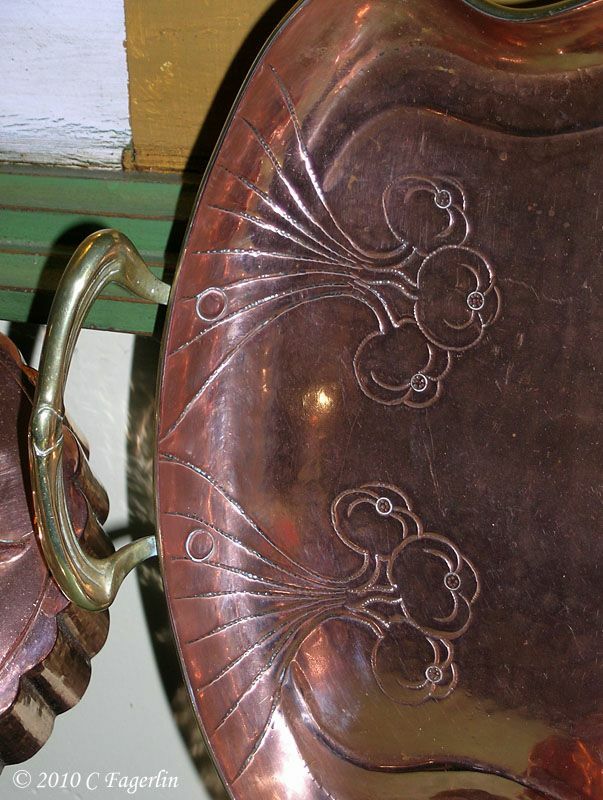 This little copper basket is Greek, I love the "art deco" design on it. I have lots of these little molds, they look great done in aspic or jello for a buffet table. This very old mold appeared here on TLRT a few days ago on a Mardi Gras tablescape. Beautiful! Does it stay this shiny or do you have to clean it very often? I polish it when the feeling hits me, not as often as I should probably. It is something I enjoy doing, so I don't know why it takes me so much thinking to get started. Check back in a few, I'll go add the text that was lost. I like copper but I don't think I could tell the vintage stuff from the new stuff. That is one of the best copper collection I have seen. Each piece is a work of art. Very well done. I sure love your display! And - eggs are popping up all over at our house too - the chickens have started producing BIG TIME! Have a great day! 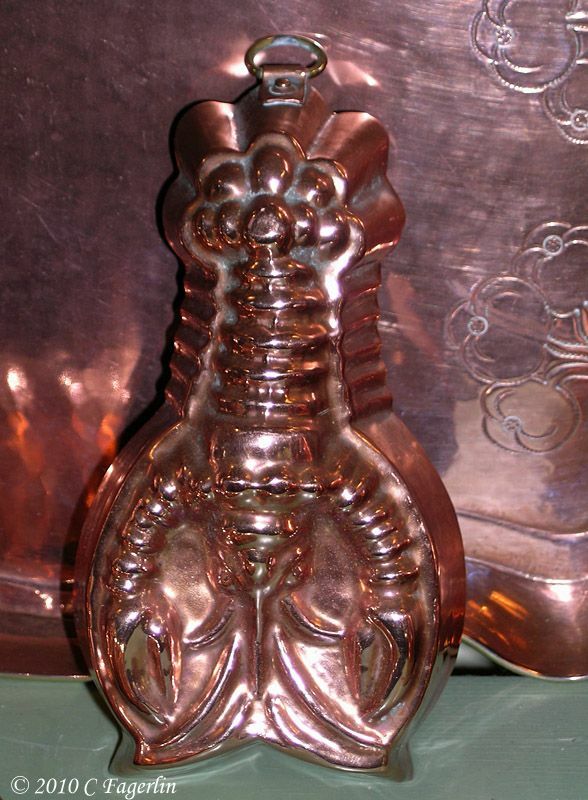 How DO you clean copper? I knew people collected it, glad to have been proved right! Great stuff, those are beautiful. Thanks for sharing. Really pretty pieces! I especially like the tray. I like your stone eggs too. Beautiful pieces, and thanks for the closeups of the detail. The Greek basket is especially gorgeous! Lovely copper pieces. A great collection. All your pieces are really lovely! What lovely pieces. Thank you for showing these! I have to ask, have you ever made an aspic? My husband keeps going on and on about them since we saw Julie and Julia AND he gave me Julia Child's iconic cookbook. Hope you'll share! My mom had a wall full in the kitchen. And she was a big aspic fan. Oh gorgeous copper! I love old jello moulds- especially fond of your lobster one! The are exqusite pieces. The presention is lovely. Thanks for the post. 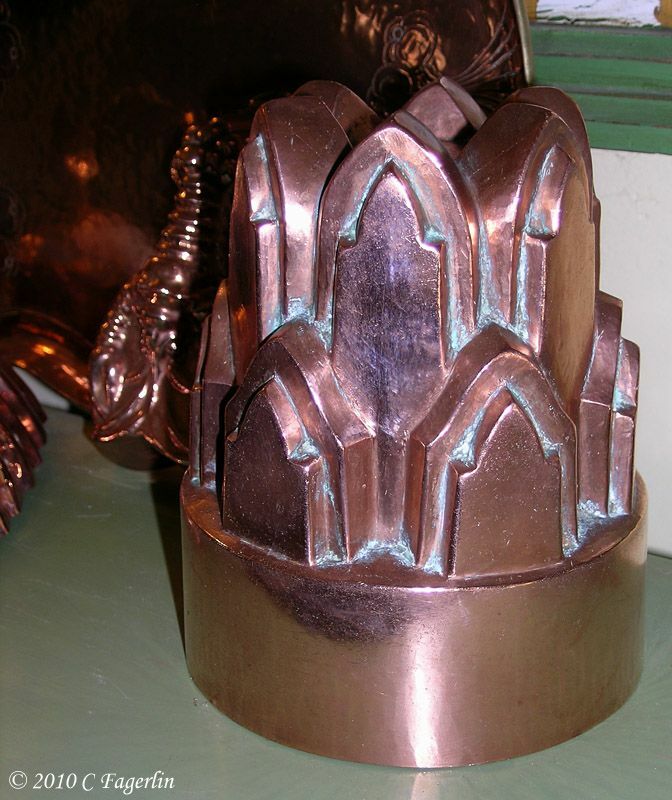 Your antique copper molds are beautiful. 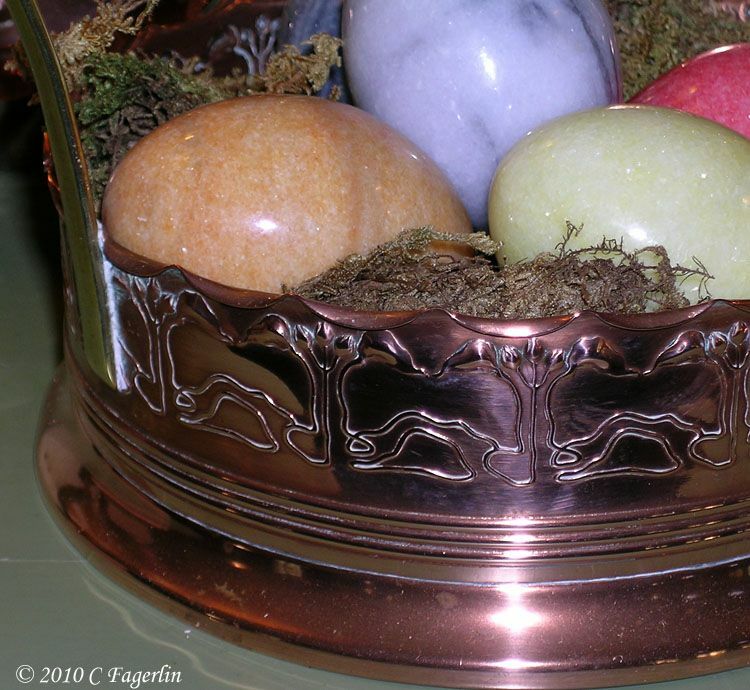 And your Greek basket is lovely, I also have some of those pretty alabaster eggs! 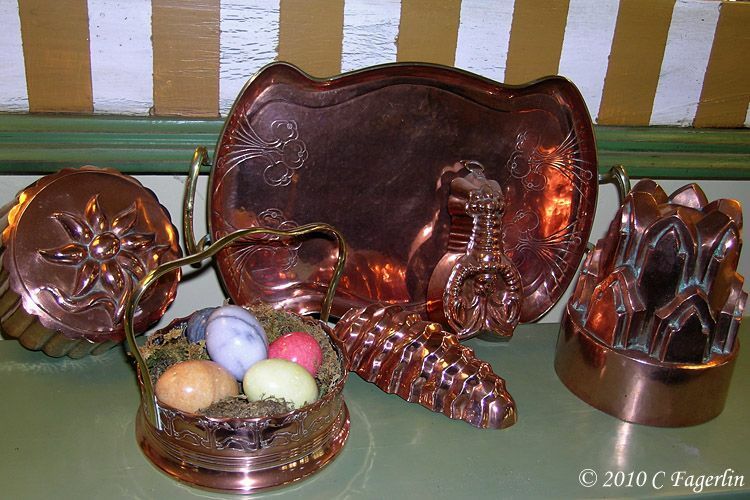 The copper molds, as well as the Easter eggs, are so beautiful! Enjoy your blog! 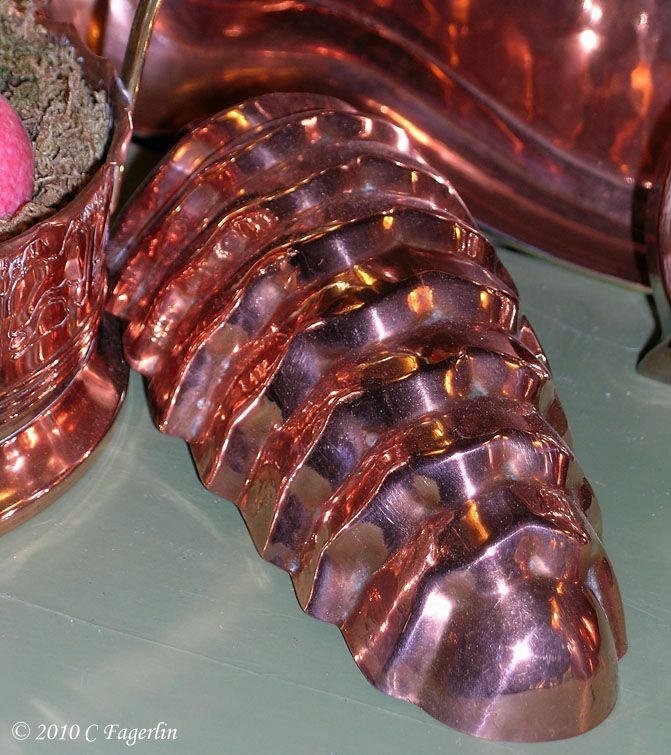 This is a very beautiful collection of copper, I love the serving tray and basket....is it work to keep it up? Have a great VTT!! You have a beautiful collection. 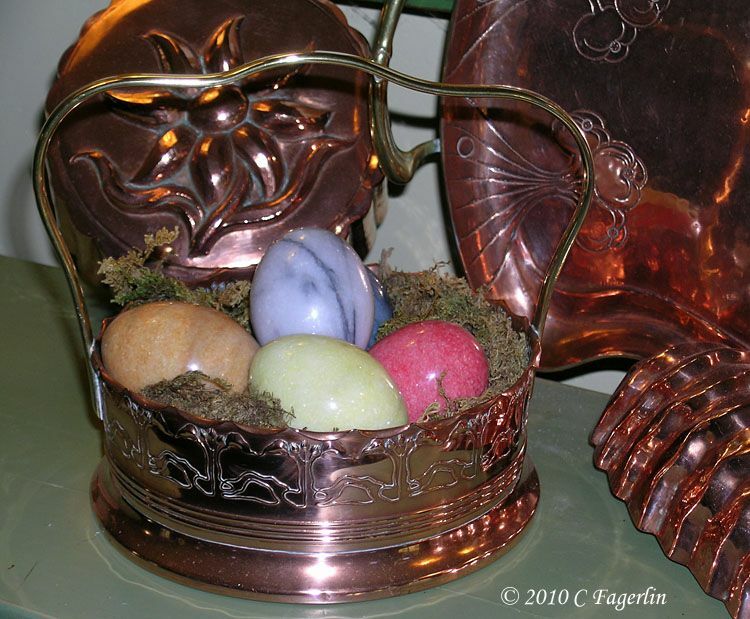 I like the basket with the colorful eggs, so perfect for spring. Thanks for all your lovely comments on my copper! I'm glad you enjoyed it! As far as cleaning it, I use Simichrome polish (comes in a red can or tube either online or at some hardware/home centers/ antique stores). I swear by it, although there are other brands, this is the best one in my opinion. Soft cloths, apply to a small area at a time, buff and buff and buff some more with old soft terry towels. I'll show some additional pieces again for Vintage Thingies.....I love this party and hope to see you all again! Thanks Sarah! Come winter maybe I can get some of the other pieces polished and out for display!